October Auction: See the quilts/bid now! I was so thrilled to have it go to Houston, that I am now ecstatic to have it be at auction, instead! It is amongst some super prestigious art quilters and art quilts featured this month. That I made this quilt in the one month I had to be at my home in Oregon...in between caring for my mother, who suffers from advanced Alzheimer's in our home in Douglas, Alaska in July, and returning again in mid-August, when my father passed away..makes it a quilt that is now so near and dear to my heart. "Alzheimer's creates absolute chaos, despair, and often great grief in members of the family, as well as in the lives of those it victimizes. I was inspired by Emily Dickenson's poem "The Butterfly upon the Sky" where the poet calls upon us to emulate the beauty and the grace of the butterfly and to "soar away and never sigh, And that's the way to grieve." 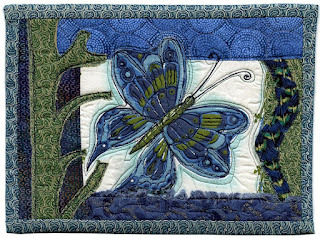 As I created this art quilt, I allowed it calming gentleness to enter and soften my own heart, as well." When I had typed his weeks before, I never dreamed, I would get to practice that softening, as well as that grieving, in just a few short weeks. Please consider bidding on my quilt, as well as any of the others. While I'm honored to be in such artistic company, at the same time, I don't want to have the only quilt still sitting in the corner at the end of the ball ;) So, get the ball rolling and place some opening bids on ALL of these amazing quilts. It is a beautiful quilt. I hope it raises lots of money for the great cause. I loved this art quilt when you first showed it. I think its wonderful what you do! Lovely, all of it. I have been thinking of you and hoping you are doing well. This is a wonderful cause, I think its just wonderful how you contribute! Yours is an incredible piece if art, straight from your heart; a sacred offering. Bless you. The quilt is gorgeous. I will bid on it.